The heavily wooded, hilly Camoes Garden was once part of the Casa Garden estate; home to the British East India Company’s chairman during the 18th century and location of the Old Protestant Cemetery. Walkways wind around blossoming trees, flower beds and headstones marking the final resting place of merchants, missionaries, dignitaries and many other foreigners who made their homes in Macau. At the garden’s entrance is a fountain holding a bronze sculpture titled ‘Embrace’, which symbolizes the centuries of friendship between China and Portugal. There is a sprawling garden beyond this, ringed by vast Banyan trees with benches in their shade, where locals come to do their morning tai chi, meet with friends or take their caged birds for some fresh air. Behind this garden is a grotto commemorating Luis de Camoes, Portugal’s national poet, built by the Macanese owner of the property after the British left for Hong Kong in 1835. The contemporary bronze bust of Camoes was installed in 1886, when the grotto became state property. Behind the grotto, paths wind their way up a wooded hill housing a Chinese pavilion, with stone tables and stools where locals gather to play Chinese chess. Opening hours: 6 a.m. – 11 p.m. 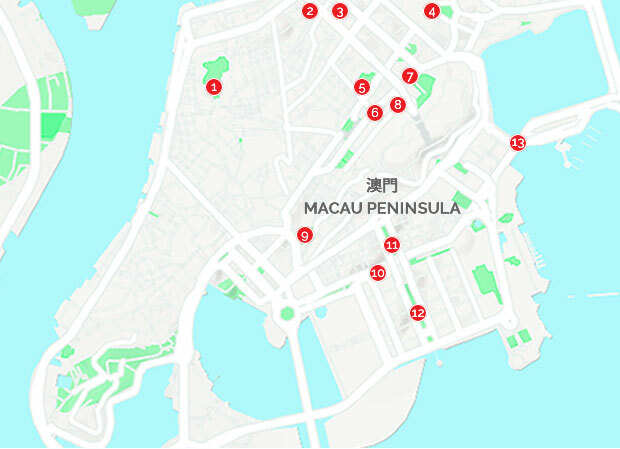 The Dr. Sun Yat Sen Municipal Park is in the North end of Macau, not far from the gate and canal which form the border with China. Throughout the park winding pathways are bordered by carefully planted flowerbeds, well maintained shrubberies and stands of trees. 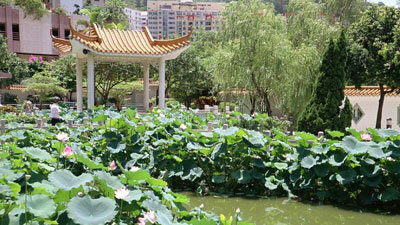 Amongst the latter is a fung shui forest which is believed to bring good luck. Other attractions within the Park’s gates are an aviary, a swimming pool, sports fields, a playground and an impressive Victorian-style hothouse with rare and wonderful plants inside. A bronze sculpture titled ‘Permanent Handshake’ commemorates the enduring friendship between Portugal and China, whilst the high points of the Park allow for uninterrupted views of Zhuhai, the Chinese Special Economic Zone on the other side of the border. 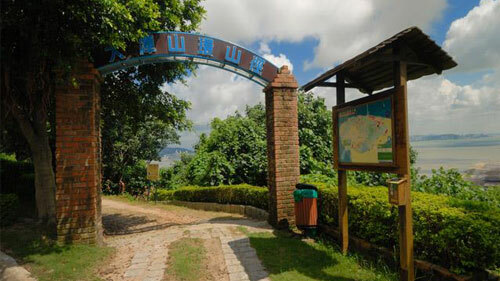 The Mong Ha Hill Municipal Park occupies land which once belonged to the Mong Ha Fort on the northern reaches of Macau. This fortress is later than many of the city’s defensive structures, built in 1841 in anticipation of a Chinese attack following the Anglo-Chinese War of 1841. completed in 1866, it was active for a century before being abandoned. Today flowerbeds, grassy slopes and winding walkways weave their way amongst the walls of the old fortress, providing peace and quiet amongst the bustling suburbs of the city and good views to the north. The Montanha Russa Park provides an island of calm and quiet amidst the bustling, built-up suburbs to the north of Macau’s centre. Situated next to the New Protestant Cemetery, the park’s name combines the Portuguese word for mountain with the Chinese term for snail, due to the spiralling path within the park that winds to the top of the hill around which it sits. The Park’s secluded benches are a favorite haunt for lovers, offering a modicum of privacy amongst the stunningly diverse and carefully labelled flora. Near the entrance to the Park is a delicious Portuguese restaurant with both indoor and outdoor seating, allowing patrons to the enjoy the environment of the area. Opening hours: 6 a.m. – 9 p.m. 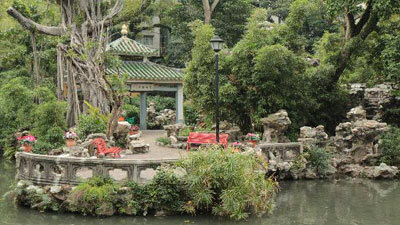 The Lou Lim Leoc Garden is the most Chinese of all Macau’s green spaces, having been built by the merchant Lou Kau and inherited by his son, Lou Lim, in 1906. 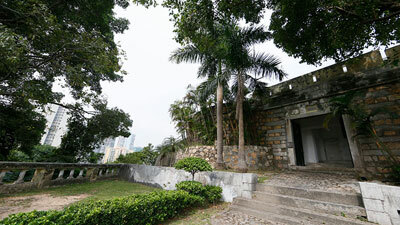 The decline of the family’s fortunes saw the garden fall into ruins, until it was purchased and renovated by the Macanese government, who opened it to the public in 1974. The Garden is modelled on those of Suzhou: high walls enclose a miniature landscape through which wind narrow paths, negotiating bamboo groves, bloom-laden bushes and model mountains. A large lotus pond filled with golden carp takes pride of place, with a nine-turn bridge weaving its way across it to a large pavilion. The design of the bridge derives from the belief that demons can only move in straight lines, thus protecting the building on the water. Often the venue of exhibitions and events, the pavilion is a gorgeous mixture of European and Chinese styles, the epitome of Macau. Victory Garden, an arrangement of stone terraces with lovingly groomed flowerbeds and comfortable benches for footsore tourists, commemorates Macau’s defeat of Dutch invaders in 1622. The Garden is a popular haunt for students from the school next door. Opening hours: open daily, 7 am – 8:30 pm and the admission is free. Guia Hill, known as the lungs of Macau peninsula, is the tallest, greenest and most picturesque hill, and has few attractions that are well worth seeing. Flora Garden (Jardim da Flora), at the foot of the hill, is a nice European-style park with a small zoo an aviary and some landscaped gardens with manmade cascades. From the park, you can wind along the stone path that climbs to the top of the hill, passing by belvederes and small manmade waterfalls. Those of you who don’t want to huff and puff all the way up can opt for the lazier option of taking the cable car, and enjoy much nicer views on the way. The cable car’s lower station is near the park’s gate. The trip costs MOP$ 3 – one way or MOP$ 5 – return. 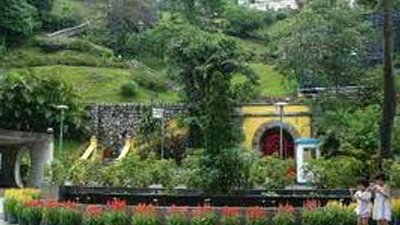 The Vasco da Gama Garden, along with the Victory Garden, was created in the late 19th century on what used to be Avenida Vasco da Gama. 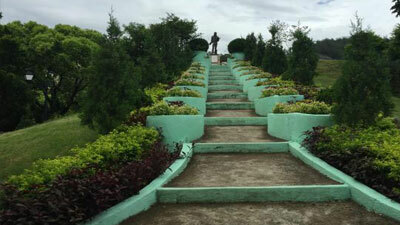 This Garden, dating back to 1898, commemorates the 400th anniversary of the eponymous navigator’s arrival in India. The remaining avenue is lined with tall and imposing trees, planted on the anniversary, which give the walkway the feel of a country road. Amidst the greenery stands a notable bust of the Portuguese navigator, made in 1911 by the famed sculptor Tomas da Costa. The Garden has benefited from recent renovations and improvements, including the addition of an expansive lake snaking around the lower levels and a spouted fountain surrounding the bust of da Gama. 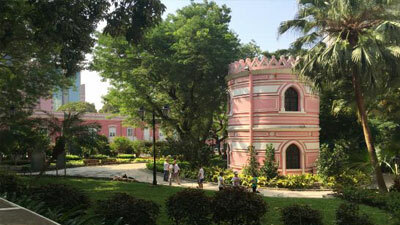 The Francisco Garden sits next to the beautiful pink and white colonial building that houses the St. Francisco Barracks and Military Club. Gorgeous flowerbeds flank wide paths leading to a finely carved stone staircase that climbs to a tower, first built in memory of combatants fallen in the First World War, but now recommissioned as Headquarters for the Association for the Handicapped. The garden is a popular meeting place for the students of nearby schools. 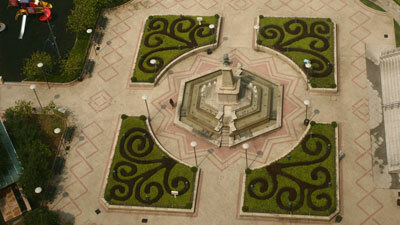 Opening hours: The section between Praça de Ferreira do Amaral and Rua de Cantão: 24 hours Other sections of the Garden: 6 a.m. – 11 p.m. 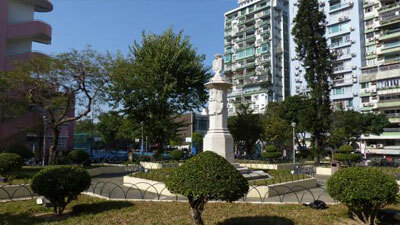 The Arts Garden runs alongside Avenida de Amizade, bisecting the Dr. Carlos d’Assumpção Park and the Commander Ho Yin Garden. This stretch of green space offers a traffic-free alternative to the busy street it abuts, with flowerbeds, fountains and beautiful statuary making the walk an extremely pleasant experience. From the gates of the Garden, the Cultural Centre and Hotel Lisboa are only a stroll away along the waterfront, from where the captivating Macanese skyline can be enjoyed. 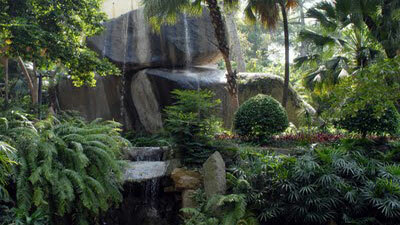 The Garden of Commander Ho Yin sits amidst modern high-rise apartment complexes, office buildings and hotels, stretching between Avenida Rodrigo Rodrigues and Avenida de Amizade. Whilst the modern city encroaches upon the space, the garden is a place of peace and quiet. Benches and tables for chess players sitting beneath the shade of ancient trees, set within an environment of lovingly maintained bamboo groves and shrubberies. Within the park can also be found a playground and a small but delightful cafe. The Park of Dr. Carlos d’Assumpção maintains a green corridor running from Avenida de Amizade, through newly developed landfill sites towards the imposing bronze Kun Lam statue on the shoreline of the Outer Harbour. Dotted with fountains, ornamental ponds and peaceful arbours along palm-lined avenues, the park offers visitors a retreat from the busy streets of the city. A playground provides children with a place to play, whilst at the water’s edge on the Harbour end of the park is a promenade offering views of the Outer Harbour, Taipa Island and the bridges between. Urban water reservoir located in between Guia Hill and Macau Maritime Ferry. 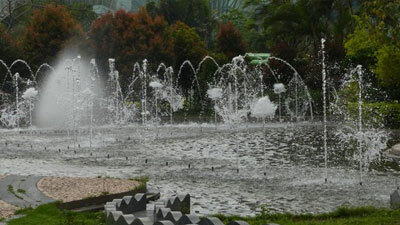 It is Macau’s first a water reservoir. 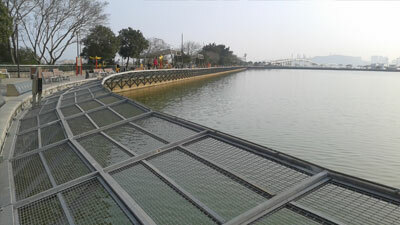 The reservoir shores were recently landscaped into public spaces and walkways with 2.6 km length. Nice for walk, sports and family walking. 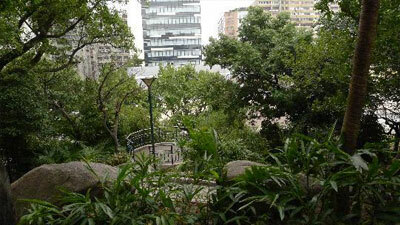 The Little Taipa Trail is situated in northwestern Taipa, reachable via Estrada Lou Lim Ieok. 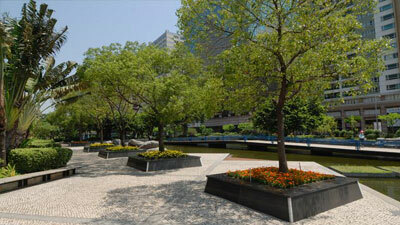 This trail is 2,3 km long, where you can find outdoor fitness areas, children’s playground and various leisure zones. 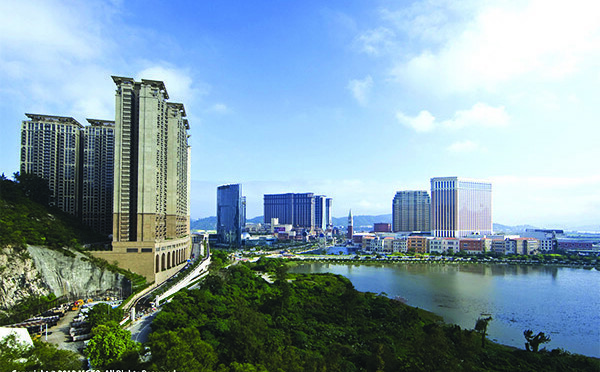 Along the park, visitors can enjoy excellent views of the Macau Peninsula, Taipa and Hengqin Island. 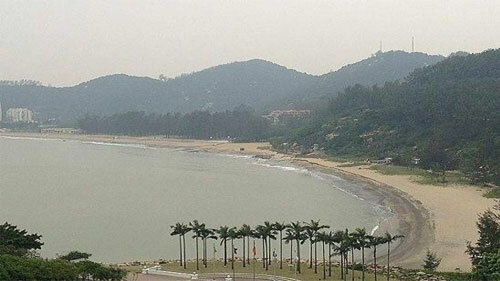 If you like nature and photography, the best panoramic view from Macau peninsula can be taken here. The Garden of Flower City, enclosed in high walls and featuring lotus ponds, cornered bridges and small pavilions, is a contemporary interpretation of a traditional Chinese garden. It is located amongst the high-rise residences of Taipa, across the street from the ParknShop supermarket, with a playground and a skate area for neighborhood children. Carmel Garden sits on a hill, next to the Church of Our Lady Carmel, overlooking the village of Taipa and the old Taipa Praia. The Garden takes inspiration from classic formal European examples, with meticulously maintained flowerbeds, gushing fountains and winding paths climbing to a small belvedere. A low-walled, zigzagging walkway runs between the park and the old praia, where a restored 1920s mansion houses the Taipa House Museum. Baía de Nossa Senhora da Esperança Wetland Ecological Viewing Zone is located at the west of the water body opposite the Taipa Houses-Museum. 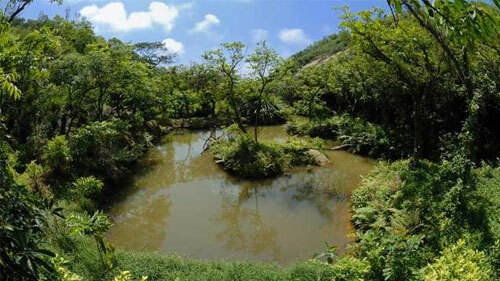 Occupying an area of 4,500 square metres, it is one of the important wetland ecological zones in Macao. The viewing zone derives its name from its proximity to Estrada da Baía de Nossa Senhora da Esperança. While appreciating and feeling the natural beauty of the environment, visitors can use the naturally-styled facilities to enjoy the nature. From here visitors can also appreciate spetaculars view of the Portuguese buildings of Taipa Houses-Museum, one of the top scenic spots in Macau. The garden is part of a larger hill, on the east side of the island right next to the airport. Visitors can have access to fantastic views from the mountain. It is a beautiful place where locals come with their kids, and several unpaved hiking trails can also be used for mountain-biking. . 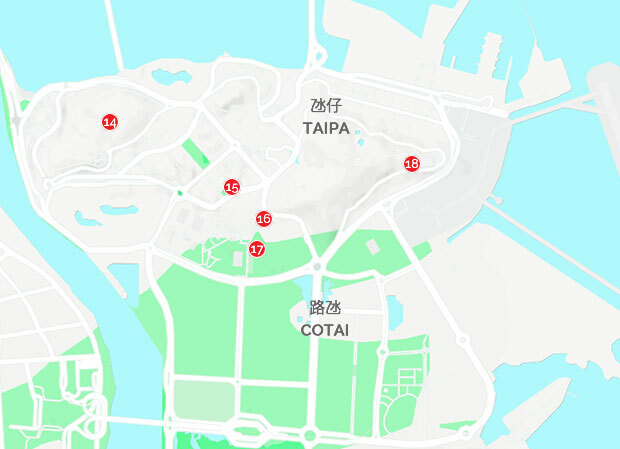 If you like walking, there is a 4km-long ‘nature trail’ around the park, which ascends Taipa’s highest point (159.2m above sea level) and takes about 90 minutes to complete. A short detour off the track will take you into the Taipa Grand Camilla Garden, a stunning reserve where some 18 species of camellias can be found. 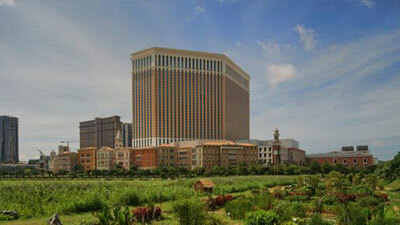 This is a unique place in Taipa away from the busy streets and visitors will be rewarded with the best photo of the Cotai Strip. 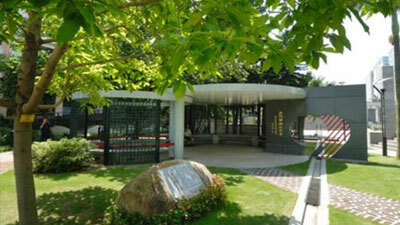 Seac Pai Van Park, hidden in the wooded hills to the west of Coloane, is a popular destination for family outings. Covering close to 200,000m2, it is one of the largest in Macau, with a wide range of attractions and facilities for visitors. 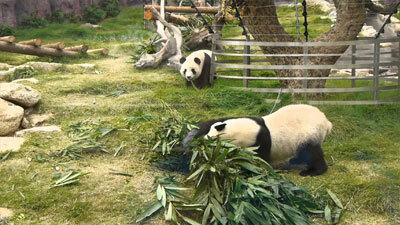 Amongst these are a small zoo, the Macau Giant Panda Pavilion and Information Centre, a large aviary and the Natural and Agrarian Museum. 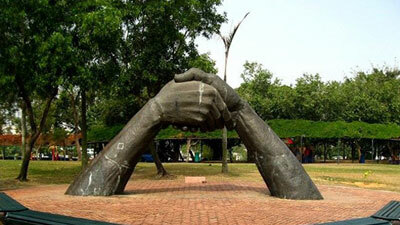 Surrounding these attractions are well maintained gardens and children’s playgrounds. Cheoc Van Beach (Praia de Cheoc Van) is a sheltered cove on the west side of Coloane Island. At one end is a boat shelter, kayaking facilities and a sandy swimming beach with changing facilities. Snack bars and restaurants along the beach leads to a free-form swimming pool. The Nautical Club, a marina where members keep various types of recreational watercraft, is near the beach. There is also a youth hostel, a pousada, and two restaurants with terraces overlooking the water. The Alto de Coloane Park sits high on Coloane Peak, reached on foot by the Estrada do Alto de Coloane, beginning close to the Seac Pai Van Park. 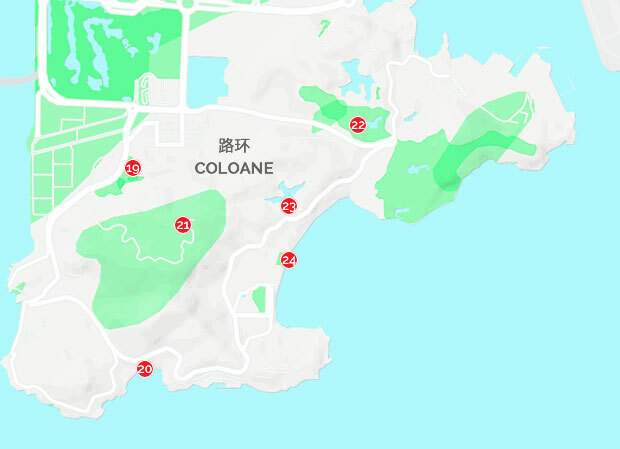 The road winds up past parking for the newly developed Recreational Fishing Zone, access points to the beautiful Coloane Hiking Trail and the Arboretum, which holds more than a hundred species of trees. 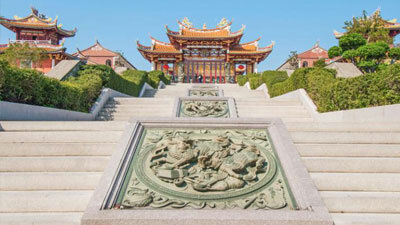 At the top of road is a parking area, a new picnic spot and the famous state of the Chinese goddess A-Ma. Standing at 19.99 metres tall, in commemoration of the date that Macau rejoined China, the statue can be seen from miles away in the South China Sea. The name ‘Macau’ derives from the Goddess’ temple, by which Portuguese sailors first landed centuries ago. 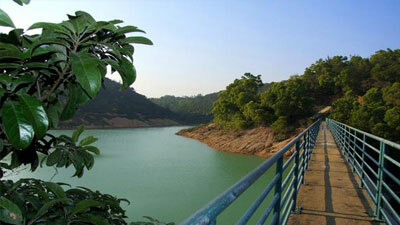 Ka Ho Reservoir Country Park in Coloane, has several hiking routes passing by Ka Ho Reservoir and Freshwater Wetlands. From the circuit visitors can enjoy bird-watching, the Hakka culture and other historical sites like the Qing Dynasty burial mounds. The outdoor experience camp and Freshwater wetland ecological zone offer a good place for leisure activities and family walks. The Hac-Sa Reservoir and Country Park lies in the southeast of Coloane Island, providing a wide range of diversions for visitors. There are numerous barbecue facilities, walking trails and forested areas to enjoy, along with canoe and boat rental for those wishing to explore the open water. Close to the dam is a camping area and a plant maze, as well as family and fitness trails. 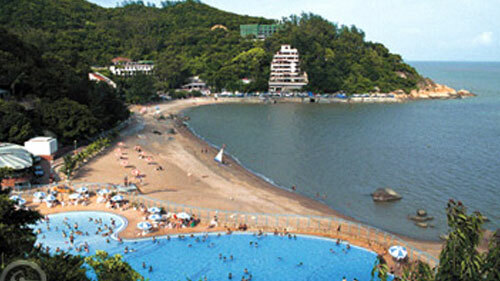 The longest and most popular beach of Macau is the Hac Sa Beach. Named after its unique black-tinged sand (“hac sa” means “black sand”) offers a good walk from Westin at one end to the residential peninsula at the other end. The beach facilities include a youth hostel, a Youth Centre for Water Sports, a sports complex with an Olympic-size swimming pool, children’s pool, tennis courts, and a sports field. There are also playgrounds, picnic and camping areas, and a variety of snack stands, cafes, and restaurants. The world famous Fernando’s Restaurant is located here.